I can’t thank you enough. This would not be going so well without your evaluation and input. Your process is very valuable. An impartial expert’s opinion goes a long way with all of us. “The presentation was very organized, clear, concise, constructive, informative and thorough.” Great job! “”I enjoyed the presentation. It was interesting, educational and pertinent. The presentation was relevant to my needs and I will use suggestions in my classroom. “It was clear and well paced presentation that was practical and useful! Great participation as a group. The information was excellent. the handouts were great and I loved the interaction”. “It was helpful to have seen the test and administered parts of it prior to the presentation”. “I enjoyed the powerpoint and print out very much. The information was great for teachers and parents too”. “Relevant, helpful….examples were great and videos were helpful…Great ideas and clear instructions. I am writing in support of The Center for Social Enrichment and Educational Development. I have met with Evan Schermer, President of The SEED Center and have contracted with him to provided added supports to students on an individual as needed basis to supplement their educational program and to provide consultation for programming needs. Mr. Schermer has worked as an internal autism consultant for the 4 years and The SEED Center has implemented services with many students that are within the Public School systems. Families have expressed great satisfaction with these services. The SEED Center has done an excellent job with all services assigned and they are thorough yet thoughtful about the necessity of services. The professionalism of reports and PPT participation has been outstanding. It is my pleasure to write this letter in support of The Center for Social Enrichment and Educational Development. I have met with Evan Schermer, President of The SEED Center and I am confident that he provides exemplary service to the families he works with. Mr. Schermer has been an internal autism consultant for the past 4 years and currently has contracts with Stamford Public Schools to provide autism services. Also, many of the families that are members of our organization, Stamford Education 4 Autism, use the services of The SEED Center. The parents are delighted with the services that Mr. Schermer and his staff provide. They know that at the SEED Center, their children are receiving top-notch services and that their concerns and questions are also being addressed. It’s a win-win situation for all, done in the most caring and professional way. I strongly feel that The SEED Center is well suited to address the overwhelming need for evaluations and services in the Stamford area. The SEED Center has the experience, not to mention, knowledgeable staff whose work has demonstrated success in an efficient manner. They go above and beyond and we are very grateful to have them in Stamford. They have been an asset to the community and families that I work closely with within the Stamford Schools. Many parents fear the transition planning from High school for their young adult with challenges that require specialized modifications and qualified individualized support. For me this was an emotion that had overwhelmed me and one that felt hopeless. After visiting several post high school programs, I learned about the Center for Social Enrichment and Educational Development. After meeting with Evan Schermer, founder and Director, I experienced a positive outlook and hope for my daughter’s transitional needs. My daughter has made significant progress through her individualized program support at SEED Center over the past 6 months. The focus is always on her abilities and a true celebration for who she is. When goals are met, new ones are developed. When challenges are experienced, they help my family to build bridges to get to where she wants to go. SEED Center has given our daughter a voice, and helped us to learn to give her greater opportunity to advocate for her needs and wants. SEED Center is a valuable asset to our community. Evan, and the professional staff at SEED Center, offers a true interdisciplinary approach to support for all children with varying needs and abilities. The staff works well with school based dynamics and provides flexibility and creativity when planning for what each child needs and deserves. SEED Center has been life changing experience for my daughter and for my family. On a weekly basis we experience growth impacting the quality for her life that also in turn opens new possibilities for us as a family. It is a place where families can be assured that their children can feel comfortable to learn to cope even when the process may be difficult for them. Reassurance, mutual respect and integrity are clearly communicated by everyone at SEED Center. The SEED Center has been an integral part of service delivery to my six-year-old twin boys who are diagnosed with PDD NOS. My family has received services in our home and at The SEED Center since it opened. I am writing to give The SEED Center the highest recommendation to become a Birth to Three Provider. The SEED Center, and all of the caring, highly qualified staff have become a part of our family. When we have a need, they have the flexibility to meet that need in whatever setting is most appropriate and my boys look forward to every interaction that involves members of our SEED Center family. Courtney Bitting, BCBA, comes to our home for two hours each week and I can’t say enough about the professionalism, care, and quality of service she provides. By her flexibility and ability to provide services in our home, we all benefit by learning from the strategies and modeling she provides. The sensory gym located in The SEED Center where my boys not only receive needed services, but have fun in the process climbing the rock climbing wall and using the swing. The Center provides services on the weekends to accommodate family schedules and one of my boys also participates in a Saturday Social Skills Group. The SEED Center truly has all the bases covered in their ability to provide quality services. Furthermore, they communicate daily with the family and take in what the family needs and wants and helps design a program specific to the family. When issues arose with one of my boys in the Public Schools, The SEED Center was there to help guide me. 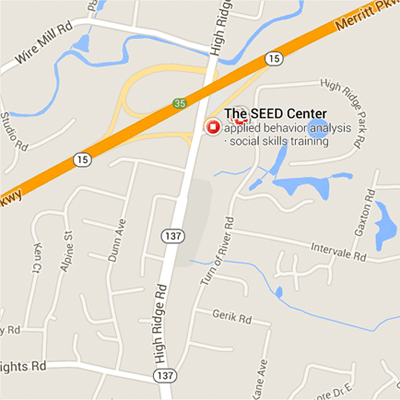 When my son needed academic tutoring, The SEED Center provided that to him. My son not only learns and enjoys the sessions, but is now using state of the art technology such as the i-Pad, SMART Board and computers to pursue his many interests such as learning about volcanoes. I can’t say enough about the benefits of having The SEED Center as part of our life.